No motels and hotels this year! Enjoy Florida in the comfort and style only afforded with the space and amenities in New Smyrna Beach vacation rentals properties. This beautiful beach is on the east coast of Florida, about 20 miles south of Daytona Beach and just north of Cape Canaveral. The city is named after an old Turkish city, "Smyrna", birthplace of the founder's wife. This vacation, live among the natives but don't do without the modern conveniences, privacy, and comfort of your own home. Dock your boat and fish in the canal in your New-Smyrna Beach vacation rentals backyard; walk the beaches at sunset; swim in your own pool; cook in the kitchen; snack when you want; watch TV and relax in the comfort of your "home-away-from-home". For the outdoor type staying in New Smyrna Beach vacation rentals and those who want to experience more, choose from boating, boat rentals, boat charters, fishing guides, ECO tours and a lot more; collect shells at some of the finest shelling beaches in the world; visit some of our "eco-parks" or just spent some time on the trails at some of the beaches and remote islands. 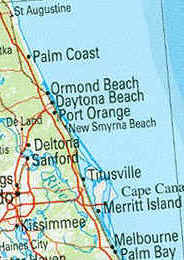 For a list of attractions and driving times close to New Smyrna Beach, click the link.